William Sgrazzutti is our Music Director, effective March 1, 2014. Bill brings many strengths to this position. The music at First Presbyterian Church follows the readings of the Lectionary and the Liturgical Year. Choir anthems, vocal solos by members of the choir, instrumental solos and piano and organ selections are presented throughout the year. The choir sang in the world premiere performance of Michael Conway Baker’s “Reflections”, a work for flute, cello, piano and wordless chorus. “Easter Sequence” a work in three movements by US composer Dr. Joe Utterback, was given its world premiere performance in First Presbyterian Church. A wide variety of music is included in worship wiht the organ and piano supplemented by guitar and other instruments. A CCLI license has given us access to a large collection of spiritual music. Jack Partridge passed away June 4, 2013. His loss will be felt deeply by the congregation as he had been the music director for 46 years. Our thoughts and prayers are with his family at this difficult time. Jack Partridge was the Music Director at First Presbyterian Church since August, 1967. Since that time the choir performed many large choral works including the Faure Requiem, Saint-Saens Christmas Oratorio, portions of Handel’s “Messiah” and two commissioned works, the “Posaune Oratorio” by Elizabeth Raum and “Reflections” by Michael Conway Baker. Jack accompanied many notable artists, both vocal and instrumental, both at the church and in the concert hall. Jack was also employed as the Arts Education Coordinator for the Regina Board of Education from 1981-1998. He adjudicated for the Saskatchewan Music Festival Association and was a member of the Board of Governors of the Regina Symphony Orchestra. The choir sings from early September until the end of June. Sunday morning services, concerts and an appearance at the annual rotary Carol Festival keeps the choir active through the year. Choral music from many periods of music are sung with a special emphasis on music composed since 1980. An annual Christmas Cantata and performances with Brass Instruments are highlights of the year. Choir practices are held in the sanctuary on Thursday evenings at 7:30 pm. New members are always welcome. Leave a message with the church secretary (522 9571)to make arrangements to join this very sociable and talented group. The piano is dedicated to the Glory of God and to the memory of Ellen Santo. Funding provided from the Ellen Santo estate, October 21, 1999. The pipe organ is located in the chancel. 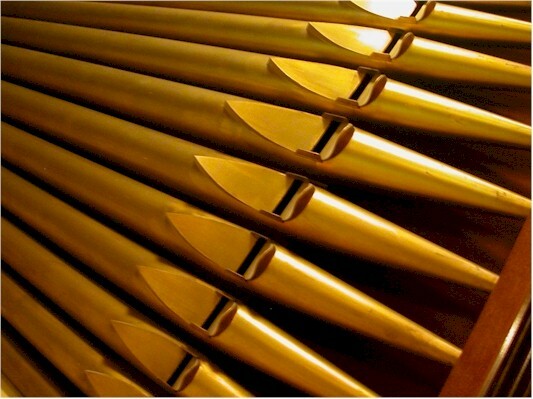 The Swell Organ (top manual) is located on the pulpit side of the sanctuary and is under expression. The Great Organ (bottom manual) and the Pedal Division is located on the organ console side of the sanctuary. Both Swell. Great and Pedal pipes are located behind the facade. The facade pipes, painted gold, are non-speaking pipes that are used as decoration. The Yamaha upright piano is dedicated to the loving memory of a Allan C. McEachen and to the greater Glory of God by his family and friends, December 11, 1977. Located in the balcony at the east side of the sanctuary, the Baldwin (electric) organ has two manuals and a full pedal board. This instrument is used on occasion, both as a solo instrument and also to accompany vocalists, instrumentalists and the choir.